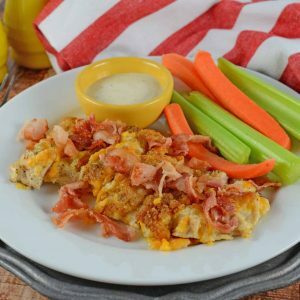 Bacon Ranch Chicken is an easy baked chicken recipe using a creamy mayonnaise base with bacon and ranch seasoning. In a small bowl combine mayonnaise, garlic, dry Ranch seasoning and cheddar cheese. Lay each breast on a cutting board, cover with plastic wrap and tenderize until ½ inch thick. Repeat with each breast. Transfer to a baking dish lightly coated with cooking spray. Season each chicken breast with fine sea salt and freshly ground pepper. Divide mayonnaise mixture evenly on each chicken breast, spreading out to the edges. Bake for 15 minutes, remove from oven and top each breast with bread crumbs, pressing down lightly to “catch”. The size of your chicken breasts will determine the amount of bread crumbs you use. Return to oven and bake for additional 15 minutes or until chicken is thoroughly cooked. Cooking time might even be less depending on the size of your chicken breasts. Remove, top with bacon and serve. If you've tried this recipe, come back through and let us know how you liked it!